Pat said: “It is interesting to note an advertisement in 1838 — 36 years after the burgh received its charter — concerning the sale of the lease of Helensburgh Distillery, situated at the corner of Argyle Street and Maitland Street, before the railway’s arrival cut Maitland Street and Grant Street in two. This dam was in fact the millpond for Malig’s Mill which was situated in Hermitage Park more or less where the Victoria Hall is now. The pond was where the putting green is today. Distilling was taking place earlier than that, legitimately at two distilleries in Rhu and at various illicit stills in the area which were an important part of the local economy. The parish in 1791 had a population of about 850, and they patronised eleven ale or whisky houses, only one of which was really an inn. By 1832 the population had reached 2,000 — and there were 30 public houses. So a liking for a dram can be fairly said to be a Helensburgh tradition. Thus it is entirely appropriate that Clyde Whiskies partners Duncan Reid and Fred Flint, who are planning to open a shop in Clyde Street at the beginning of May, are organising the bottling to mark the 25th anniversary of the Town Twinning Association. 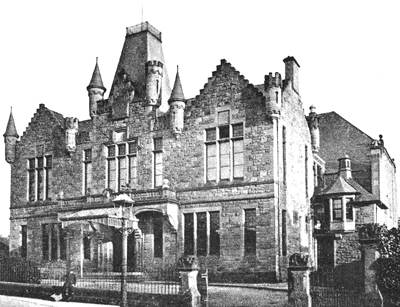 The label will feature an old postcard of the Victoria Hall supplied by web designer and Helensburgh Heritage Trust webmaster Jim Chestnut.